There are infinite variations to a Dosa.Too bad only one was posted.A poor performing blender kept me from making dosas for long.That changed after buying the Vitamix.Now I can make Dosa at ease in unlimited varieties. This combination Dosa with Barley,lentils and Herbs like Methi and Spinach, no fermentation required ,is the one I'm making more often for weekend brunches. Soak barley and the lentils in water over night. Drain all the water.Transfer in a wet grinder ,add the greens,salt and ginger.Add 1/2 cup of water and grind it smooth.Add another cup of water through the grinding process until the batter is little runny,as the pancake batter. Heat the non stick pan on medium high. Pour one ladle of batter right in the middle. Spread by making circles. let cook for 2-3 minutes. Flip and let cook for another minute.Sprinkle some finely chopped onions and serve warm with chutney. Same with the chutneys,since Vitamix has made the job simpler,I'm on chutney spree. Brown sesame seeds need to rinsed and toasted before grinding for best results of smoother spread\chutney . Using a fine mesh strainer,rinse the sesame seeds under cold running water.Drain all water.Let sit for about 30 minutes. 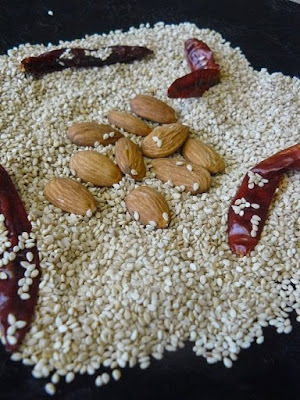 Heat a pan on medium.Toast the seeds until all dry and toasted,add the almonds and chillies in to the pan during last 2 minutes. 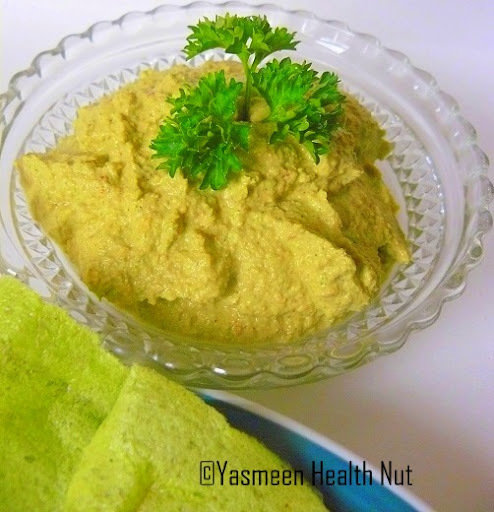 Transfer in a grinder,cover and run the machine until coarsely ground.Then add the water,greens,lemon juice and salt,and grind until smooth.Store in clean air tight container in refrigerator for up to 2 weeks.Perfect on sandwiches,burgers , dosa or with Brown rice. 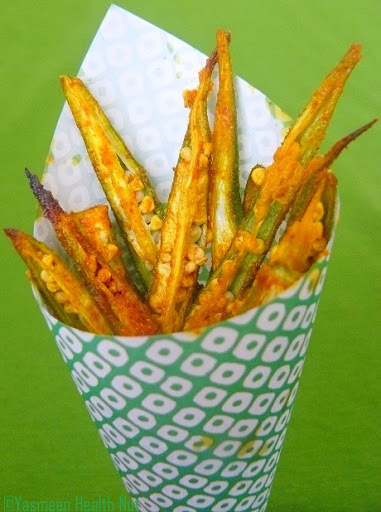 yummy delicious...for busy days I use the lentils flour just easy to mix with water !! chutney sounds delicious ! Wow. The chutney looks so good. 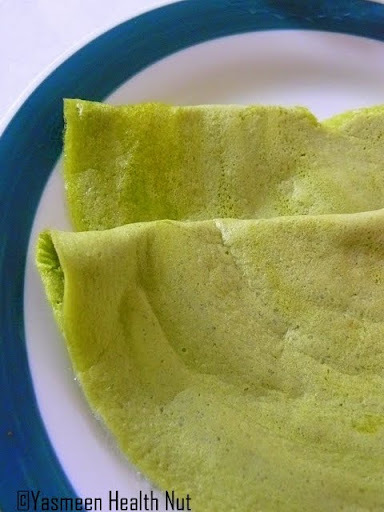 I have made dosa with greens, barley i must try.. Very original! That combination sounds delightful! WOW!! yummy recipe dear..love that color of the chutney..very nice combination. I love the pretty green color of the dosas! Love that green colour. Looks so delish. Gosh!That dosa looks real good, Yasmeen.Cld you pass me that? :)I am always in awe of the dishes you prepare..Very 'out of the box'! Wonderful dosa and chutney ! love the dosa recipe, quick one for a lazy day ! have to try barley in cooking..seen in so many blogs and love the addition..the chutney is awesome..
Those look excellent to me. Love everything about these two recipes. But the chutney is soooo appealing. Dosa looks tempting and chutney sounds divine. So creative, Yasmeen. The color is so vibrant, and I'm loving the use of barley. Barley's such an unsung kitchen hero! I have never had dosa but I would love to try! 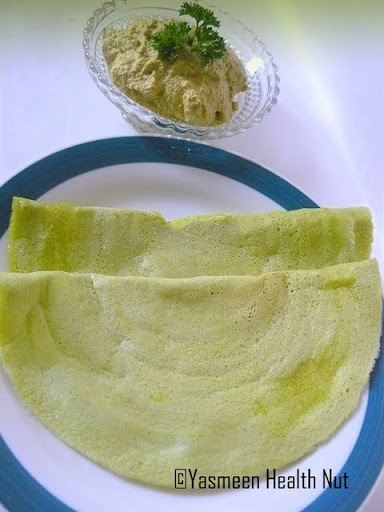 The green color of dosa looks very inviting.. chutney looks good too. Have never tried grinding the greens along with the other ingredients. Should try it soon. Barley dosa sounds so wholesome n hearty. Love the addition of spinach. lovely green color! 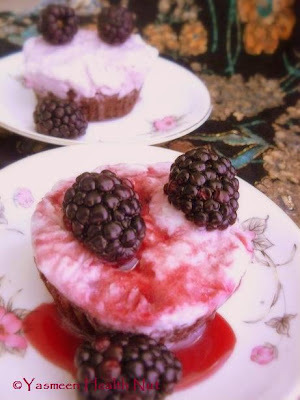 looks very delicious, love to try it. Barley in dosa I yet have to try....using it in soups only...dosas look crispy. Mmmm...everything about this sounds so good. It's definitely some new dishes and flavors for me. Just the kind of thing I need to try. Green is always good to eat.Nice food. 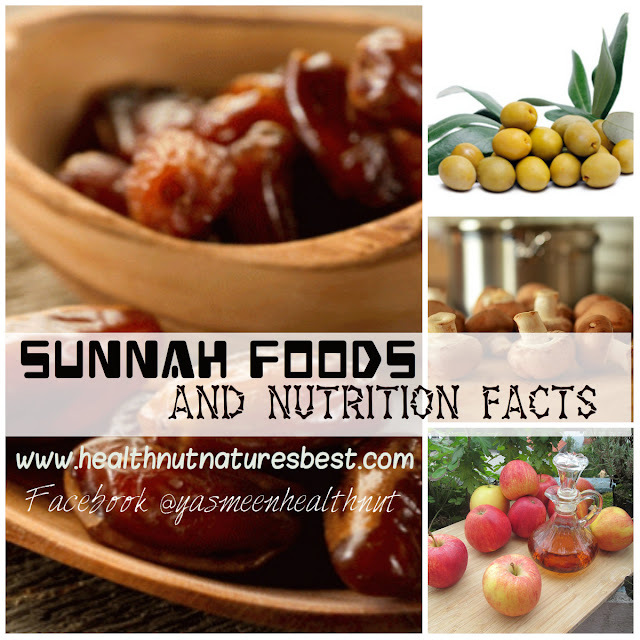 Hi Yasmeen,ur blog looks great with great recipes.keep it up!!! wow thats a interesting recipe Yasmeen both dosa nad chutney looks so delicious will try this for sure. thanks for the idea dear.